It is that time of the year again. Everyone wants to lose weight and trim their waistlines. Abs, abs and more abs, right? I am all about some core training, but I am always concerned with some of the ab variations that I see commonly used at the gym and in group fitness environments. Many exercise enthusiasts have tight hip flexors and poor abdominal control. Sprinkle in a history of low back pain or a prior disc injury along with straight leg abdominal exercises and now you have the perfect recipe for a possible back injury. Why is that? Well, the psoas originates from the lumbar spine and attaches to the lesser trochanter on the hip. 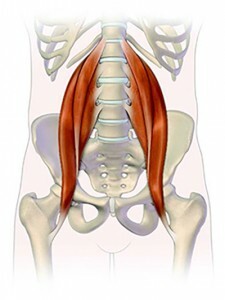 In the picture above, you can see how the muscle impacts the spine and hips. As you lower your legs toward the ground during an ab exercise, there is a reverse muscle action that takes place and resultant anterior shear force exerted on the lumbar spine. When the abdominal muscles cannot resist this motion, the lumbar spine hyperextends. Many people will even report feeling a pop in the front of the hip while doing scissor kicks, leg lowering or throw downs. In many cases, this may be the tendon running/rubbing on the pectineal eminence. Unfortunately, long lever and/or ballistic abdominal exercises with inherently poor core stability/strength, fatigue and gravity working against you will create significant load and strain on the lumber spine. Ever wonder why you wanted to put your hands under your back while doing 6 inches? Your brain is trying to flatten the spine using your hands as it knows the hyperlordotic position is uncomfortable and threatening. In light of this, I put together a little video for PFP Magazine revealing a safer way to work your abs and prevent undue stress and strain on your back. Check it out below. Keep these modifications and progressions in mind the next time you hit the gym or a boot camp class focusing on core/ab training. 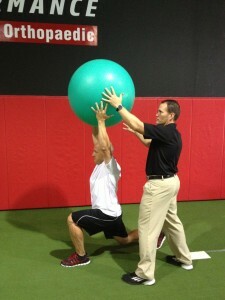 Improving lateral chain strength is always a priority when training or rehabbing athletes. Improving anti-rotation stability is particularly important for injury prevention and dissipation of forces in the transverse plane. Whether working with a post-op ACL client or training an overhead athlete, I am always seeking ways to increase torso/pillar stability to increase efficiency of movement and reduce injury risk. This video below from my Functionally Fit series for PFP Magazine will demonstrate a great exercise do accomplish these training goals. Increasing shoulder, torso and hip strength and stability is a common training goal for athletes involved in sport. Facilitating hip disassociation and kinetic chain linking with exercise is always a plus. I like to use a diagonal mountain climber with hip extension to accomplish these objectives. More specifically, I utilize this exercise with my overhead athletes and anyone involved in cutting, pivoting and rotational sports. This exercise is an excellent way to promote shoulder, core and hip stability while facilitating hip disassociation as well. Driving the hip back up into extension will activate the gluteals and simultaneously force the stable (fixed) hip to stabilize the pelvis and counterbalance the movement pattern. In addition, the client will have to effectively activate the hip and abdominal musculature throughout to avoid unwanted pelvic tilt/rotation during the movement. Click here to view the full video of this exercise I did for my ‘Functionally Fit’ column for PFP Magazine. 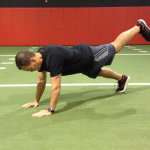 I like to include exercises on this blog that are useful for rehab and fitness professionals as well as fitness enthusiasts who visit. This is a cool exercise that a colleague taught me. I also recently shared this as part of my ‘Functionally Fit’ column for PFP Magazine. 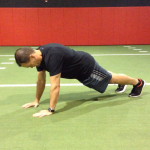 It works great when doing partner workouts or if coaching a client. We used it during our off season training for the Carolina Hurricanes and it is much harder than it looks on the surface. Begin in a split squat position holding a stability ball overhead. The client maintains an isometric split squat while the coach/trainer provides directional perturbations in an attempt to disrupt balance and stability. You may opt for several quick rhythmic perturbations or elect to use more sustained pushes (1-2 seconds in each direction) to challenge the client. Allow the client to reset to the desired position if he/she does lose balance in order to facilitate optimal motor patterning. Perform 30 seconds with the left leg forward, rest 30 seconds and then repeat with the right leg forward. Complete two sets on each side. Be sure to observe asymmetries or deviations specific to either side as this will allow for better cuing and reveal energy leaks. Marking the desired distance between the front heel and rear foot toes with tape will ensure consistency for each trial side-to-side. 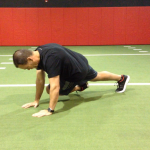 This exercise is very effective in training kinetic chain stability and proprioception. Holding the ball overhead allows the trainer to challenge clients to resist movement in the sagittal, frontal and transverse planes through upper body driven loads and feedback. Additionally, the client must focus on maintaining an upright posture while the lower body musculature remains engaged. For those with difficulty holding the ball overhead, consider holding the ball at shoulder height at first. Keep in mind the perturbations should be graded and not designed to push the client over or completely off balance. One additional note to consider: you may opt to instruct the client to remain rigid throughout the drill or allow them to be relaxed and then respond with reactive rigidity when the perturbation comes. Experiment with your clients and programs and see what you think!